• Rudder servo with 0.02sec/60° ultra high speed response, pushing the extreme. 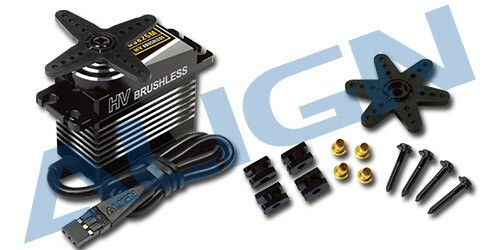 • Supports 8.4v high voltage to provide optimal speed and torque performance of the brushless servo. • Designed specifically for helicopters, with highest specifications on the market: 0.02sec/60°ultra fast speed and 12.5kg-cm monstrous torque, allowing helicopter to perform with faster and higher precision. • Ultra high signal resolution for excellent precision and smoothness. • Hardened high strength superalloy gears that increase the lifetime. • Brand new high voltage brushless servo equipped new CNC machined aluminum case, not only exhibited top of the line servo aesthetics, but also combine heat sink function and best protection for the servo. • Supports both analog and digital control signals. • Suitable for T-Rex 550/600/700/800 rudder use.